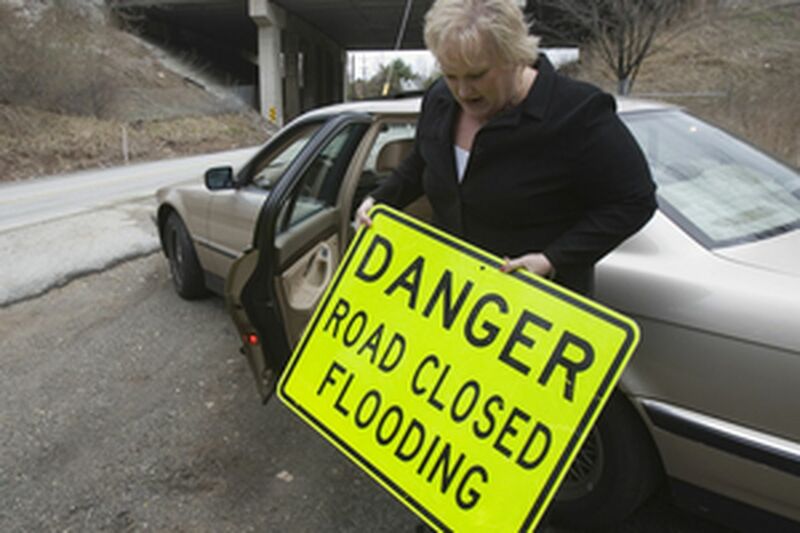 Mary Pat Kielinski of Whitemarsh's stormwater task force posts a warning on Stenton Avenue. She had severe property damage. Would you pay a new levy to help your community control flooding? How much would you ante up in the name of dry basements and passable roads? In about 500 counties, towns and cities across the nation, property owners already are charged what is called a storm-water utility fee, a dedicated source of money to repair or replace drains and pipes. In Sarasota County, Fla., it comes to $87 a year; in Littleton, Colo., $24. Wilmington is sending out its first bills this month, averaging $47 annually. Philadelphians have paid since 1968, with the tab now $106. The rest of Pennsylvania and all of New Jersey have been fee-free. But the idea is rippling through the Philadelphia region, Harrisburg and Trenton, along with a growing sense that such a levy might be inevitable. Especially in heavily developed suburbs, downpours and even moderate, steady rains have been packing an ever more damaging punch, and exposing the frailties of aging, inadequate infrastructure. Whitemarsh, nearly built out, has suffered some of the worst flooding of the last decade in Montgomery County. The estimated cost of upgrading the storm-water system to handle the deluges: $12 million. "And we don't have $12 million," said Christopher R. van de Velde, manager of the township of slightly more than 17,000 residents. Whitemarsh has directed its solicitor to research storm-water utility fees. Radnor Township on the Main Line has hired a consultant. Those are bold moves. For although flooding is a dreaded event, the fear factor in elected officialdom is asking taxpayers to write another check. Nearly 80 percent of Pennsylvanians polled in 2005 complained that local taxes were too high. In the face of such irritability, State Rep. David Steil (R., Bucks) will begin this month to push legislation that could result in storm-water utility fees all over Pennsylvania. His Comprehensive Watershed Stormwater Act would give counties the power to design broad water-management plans (with input from affected municipalities) and to establish utilities to carry out those plans. A fee - Steil eschews the word tax - for repairs and maintenance could be imposed if voters approved it in countywide referendums. In Bucks County, where his district includes oft-swamped Yardley and Lower Makefield Township, $50 a year should be sufficient, he said. "Legislators don't want to be accused of raising taxes, so they don't like to pass stuff that has fees," said Steil, who introduced a version of the bill in 2005. It passed the House only to stall in the Senate. "My belief is the people are far ahead of their elected officials on this issue," he said. "When you explain to them. . . why it's necessary, how it will impact their lives and their safety, they will accept that." Pennsylvania ranks eighth in the country for flood losses, with $603.2 million in claims filed to the National Flood Insurance Program in the last 30 years. New Jersey does it one better, coming in seventh with $662.3 million in claims. New Jersey already has a statute somewhat similar to Steil's proposal. Yet the state has no storm-water utilities. One reason, experts say, is that the law provides no direction for counties and municipalities to set them up. Another reason: no provision for fees. A legislative amendment is needed, said Ken Klipstein, chief of the state's Watershed Management Program. Although none is pending, he said, "there have been a number of high-level discussions." Cleighton Smith, a civil engineer and vice chairman of the advocacy group New Jersey Association for Floodplain Management, lives in routinely deluged Medford Township. On his street, water nearly a foot deep remains for days after a storm. He said he saw the utility fees as the way "to fix these problems," but conceded others might "see them as thinly veiled new taxes," making them a potentially "difficult sell." Not in Wilmington, though. Two years ago, a state task force concluded that Delaware needed reliable funding for its storm-water needs. Wilmington took the lead, establishing a utility fee based on the amount of a property's impervious surface. With billing beginning this month, the city has fielded just 20 complaints, said John Rago, Wilmington's policy development director. That could be because the fee is accompanied by lower sewer rates. In Pennsylvania, Philadelphia led the way 40 years ago, after responsibility for cleaning city storm drains was handed to the Water Department. The fee brings in $92 million a year. But because it is based on the size of the water-meter connection, some of the worst contributors to runoff get away scot-free - for instance, owners of parking lots and storage facilities. So the Water Department is considering using impervious surface, as Wilmington does, to figure the fee - a "billing system that's fair," said Christopher Crockett, manager of watershed protection. The typical homeowner's bill should be little affected, he added. Crockett said he wished Philadelphia's neighbors would get more serious about storm-water management. Every drop of rain that falls in the northern suburbs without seeping into the ground adds to the city's water woes - and to its fees. The 56-square-mile watershed covers 11 densely populated communities in Bucks and Montgomery Counties and a portion of Northeast Philadelphia. Since 1978, $30 million in federal flood insurance claims have been paid there. The Temple researchers found nearly 50 dysfunctional storm-water management systems, including drainage basins neglected for 15 years and culverts clogged with trash. They recommended about 100 sites for repair or replacement - and suggested a storm-water utility fee as a way to pay for it. "The question isn't, 'Should we do it here?' " said M. Richard Nalbandian, a Temple geologist, "but, 'Why are we always behind the rest of the country?' "
Some legal experts say Pennsylvania law gives only Philadelphia, as a first-class city, an indisputable right to collect storm-water utility fees. Everywhere else, such fees might conflict with state constitutional restrictions on taxation. Or they might not. "There's an endless stream of legal questions here," said George Aman III, a Norristown lawyer who writes and lectures on storm-water utility fees with colleague Alan Flenner. "This cries for legislation." Steil's bill would clear up the confusion. While he prepares to introduce it, local officials should do their own sales pitch for storm-water fees, said Lisa Romaniello, a commissioner in Upper Moreland Township, a hard-hit Pennypack community. If voters can support tax increases for open space, wouldn't they also dig a bit deeper to stay dry? she asked. "Especially in our area, where we have been up to our necks in water." Commercial: Varies widely based on the meter size of each business. Exemptions: Unmetered customers, such as parking lots. *The Water Department is considering switching from a fee structure based on meter readings to one determined by the amount of a property's impervious surface. In that case, for instance, owners of parking lots would have to pay. Commercial: $43.20 a year for every 2,429 square feet of impervious cover. Residential: $57.60 a year for typical single-family house of about 3,050 square feet; $34.56 for a smaller home, such as a twin. Commercial: Based on square footage of impervious surface, including parking areas. Commercial: $50 a year per acre. Residential: $86.88 a year for a typical single-family home, estimated at 3,153 square feet. Commercial: Based on the amount of impervious surface.